Do you believe in Bigfoot? Have you seen a Sasquatch? I admit it - I'm a Sasquatch skeptic. But as Mulder of X-Files said, "I want to believe". Recently I read a news article of Bigfoot sightings in my home state of Michigan, which pushed me to do some research on this elusive and legendary ape-like or humanoid cryptid (life form that has been suggested, but not proven to exist). I sat up and took notice of a recent article in our local Michigan newspaper that reported on Bigfoot sightings in Michigan, including a few sightings in our own county near an area where we go hiking. Whoa! That's the first I had heard of Bigfoots, also known as Sasquatches, in Michigan! What does that mean? I posted that news story on my Facebook page because I thought it was pretty funny. Frankly, I figured the people who had reported the bigfoot sightings were probably nutcases, or else very suggestible and gullible. A friend responded and said she and a friend had a "Bigfoot sighting" a few years ago. "... two large brown legs run super fast across the road. Too tall and fast to be human, and too big and too few legs to be a deer. Kinda weird." My friend isn't the gullible sort. I figure she and her friend aren't positive of what they saw. But they saw something! Wouldn't it be cool if they really saw a Sasquatch! Sure, I'm a skeptic. On the other hand, I want to believe! I want there to be weird and wonderful oddities in this world, including Bigfoot! Sasquatches, or Bigfoots, are large ape-like, or humanoid creatures that purportedly live in North America, mostly along the Pacific Coast states and provinces. These hairy creatures are generally larger than humans, 6' - 10' tall, and can weigh more than 500 pounds. They typically have brown or reddish brown hair (not fur). The term "Bigfoot" was coined in the 1950's from large humanoid footprints that were found in California. Other names for this North American hominid include "skunk ape", "skookum", and "mountain devil". More ape-like cryptids (animals whose existence has been unproven) have been reported from around the world, like the yeti (abominable snowman) from Himalayan Nepal and Tibet. Rhettman Mullis, from Bigfootology, thinks that fairytales about ogres, trolls, giants, and bogeymen may really be from sightings of Bigfoot-like animals in different parts of the world. That's a fascinating idea, don't you think? This image of a Sasquatch, to the left, is probably the most recognized picture of Bigfoot. 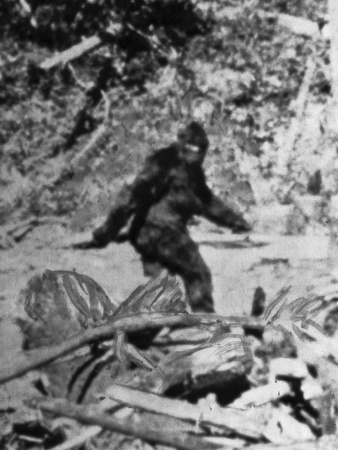 It's from a film taken by Roger Patterson in 1967 of a Sasquatch in northern California. Patterson had been searching for Bigfoot for many years. In 1967, he and his friend, Robert Gimlin, set off to explore a wilderness area in northern California, hoping to find and film a Sasquatch. Here's a YouTube link to the footage that he filmed: Roger Patterson Bigfoot film (you'll start to see a clear image of "subject" at about 26 seconds). The film is jumpy in areas because Patterson is running after the creature. Many people think this was a well-done hoax of a man in an ape costume. But Bill Munns, Hollywood costume designer and computer animator, examined the film closely, and considers it to be real. Watch Analysis of Patterson/Gimlin Bigfoot Film by Bill Munns, originally on the National Geographic channel. 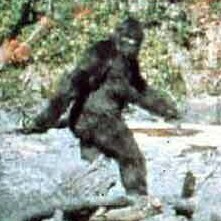 Read more about the Patterson / Gimlin film and responses, including those who think the film is fake, and those who believe that it is authentic, on OregonBigFoot.com. Most people believe that the Sasquatch is only a mythical creature, a part of folklore and tall tales, and sightings are either misidentifications of other animals such as bears, or humans wearing large heavy coats and backpacks (or in the earlier history of North America, perhaps "mountain men" wearing animal furs and skins for warmth), or out-an-out hoaxes. But there are also a number of organizations and researchers who believe that Sasquatch, or Bigfoot exists. While they agree that the majority of "sightings" are fake, they think there is enough evidence to suggest that Bigfoot does exist. BFRO (Bigfoot Field Researchers Organization) has a great FAQ page if you want to learn more about Bigfoots, including what kind of physical evidence there is, and why we haven't found any Bigfoot remains. It also lists Bigfoot sightings by region. Find Bigfoot on Facebook has posted some interesting videos with commentary. Some of these videos are also on YouTube. Many of the videos don't show much -- vague shapes and possible movement of humanoid creatures, but they're not necessarily convincing. Fake or authentic? What do you think? Not knowing much about Bigfoots, I thought that all sightings had been in the Pacific Northwest. As you can see here, most sightings are along the western states and provinces, but all other continental states and most Canadian provinces also have had reported Sasquatch sightings. My home state of Michigan shows a moderate amount of sightings. Map of Bigfoot sightings is from Wikipedia Commons, and has been released into the public domain. Map was created from the BFRO Geographical Database of Bigfoot/Sasquatch Sightings & Reports. During the week of May 21, 2012, Oxford University announced that it plans to do DNA tests on donated samples of blood, hair, and items chewed on by "Bigfoots" and "Yetis". During the next few months, a research team will decide which samples to use, and will publish their results in a scientific journal. One of the researchers, Bryan Sykes, acknowledges that there's not a big chance that they'll prove the existence of Yetis and Sasquatches, but believes the study is worthwhile. Negative results wouldn't be conclusive evidence that Bigfoot doesn't exist, but positive results would be evidence that these creatures do exist. That would be exciting, don't you think? Some previous Yeti hair samples have been tested....and they turned out to be bison hairs. Are you a practical jokester? Here's a great Sasquatch costume to fool your friends! Just don't get caught by a hunter! What do you think? Are Bigfoots real? Have you seen one or known a reliable person who has seen a Sasquatch? Or are all of these sightings hoaxes or products of over-active imaginations? Have you taken a look at some of the resources I've included that give research "evidence"? Are there such creatures as the Sasquatch? Yes -- I've actually seen a Bigfoot! Yes, because there's enough evidence for me to believe they exist. Maybe -- I hope so! No, it's all imagination or hoaxes! Share your reasons in the comment section! 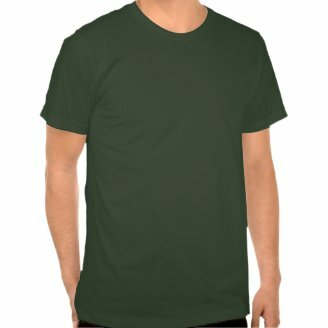 AnnArbor.com - Bigfoot in Michigan? Talk to me! Do you believe in Bigfoot? Have you seen a Sasquatch? I agree that cryptozoology should not be seen as a paranormal activity! Although I do have my doubts about the existence of Bigfoot, I also do think that they could be well-hidden especially in the vast wildernesses of the Pacific Northwest (Oregon, Washington State). They would have learned to be very cautious and secretive around humans, because humans kill what they are afraid of. I am open minded. We have fossils from Asia of a large ape bigger than a gorilla, which is named Gigantopithecus. Apparently there were three species thereof, and the last became extinct only ten million years ago, or so scientists think. But that is nothing in evolutionary time. Suppose that it were not extinct and some had got to North America, crossing the land bridge which existed in glacial times. It might still survive. My opinion on cryptozoology as it should not be seen as a paranormal activity, as some regard it. Unknown animals are a purely scientific matter to be identified scientifically. Sadly, as is the custom with academia, many academics will not accept any new phenomena/creatures, until they encounter them. Then they will trumpet themselves as the discoverers. "Professor Ego, the discoverer of Bigfoot!" I hope you find him, bigfoot123! Let me know if you do. Jo, I am such a geek about Bigfoot right now :-) I want so much for them to be real, and when I talk about it to friends, they roll their eyes or very politely try to explain why BF can't be real. They have good enough reasons, but it doesn't mean they're right. Although it doesn't necessarily mean they're wrong....I just hope they are. But the possible DNA study is very intriguing. I'm just pleased that it's not just me fascinated by this subject. I feel the same as you do about the research by Dr Ketchum. I have two scientists standing by to read it and give me their expert opinions, but it won't be legitimate until that peer review is completed. I didn't know about the actual Sasquatch body out there. Article please! I saw Jo Harrington's article on the DNA study by Melba Ketchum (I was thinking about writing it, but she's quicker than I am :-) ). There might be something to it all, although I won't be 100% convinced until the DNA results are for sure accepted by other scientists (there's another DNA study being done by another group which may be out in a month or two), and/or there's an actual Sasquatch body that is being studied. I'm keeping my fingers crossed though! There's actually another DNA study coming out as well by Melba Ketchum. She put out a press release prematurely -- it's not out in print yet -- but she thinks the results are good. We'll see!